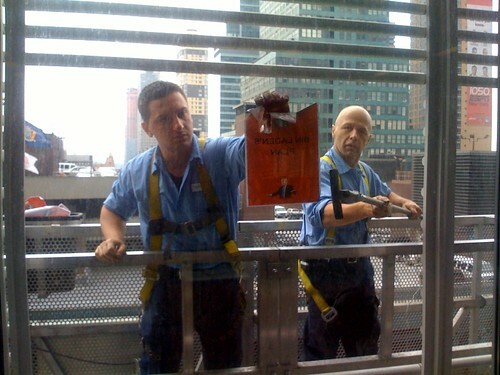 Workmen remove a flyer left behind by David Malone, who climbed the New York Times Building several hours before. Unlike the two pre­vi­ous climbers, this one — iden­ti­fied lat­er as David Mal­one, a 29-year-old activist from West Hart­ford, Conn., who stud­ies Al Qae­da — did not attempt to make his way to the roof. Instead, he unfurled a ban­ner around the fifth floor of the 52-sto­ry build­ing, before climb­ing a few more sto­ries. He scaled up the ceram­ic rods that are affixed to the out­side of the build­ing, attract­ing hun­dreds of onlook­ers inside the build­ing, as well as down the street. City Room has more about Alain and this stunt, includ­ing the news that he was arrest­ed by NYPD after reach­ing the roof – 52 floors up from the street. It was announced yes­ter­day that Google Maps’ Street View comes to more cities, includ­ing Boston. So nat­u­ral­ly, I looked up our pre­vi­ous apart­ment in Cam­bridge, MA. The weird thing is that myself, and our friends/upstairs neigh­bors Tyler and Sarah are pic­tured! We’re hav­ing our mov­ing sale, and that’s my Saab in the fore­ground. I can prob­a­bly peg the date tak­en to August 11th or 12th, 2007 – the week­end before we moved. Click the pho­to to see notes, look at it big, or check it out on Google Maps your­self. I am a lit­tle creeped out. There are two iPho­to plu­g­ins that I couldn’t live with­out – Flick­r­Ex­port, and Key­word Man­ag­er. If you like pho­tos, Flickr, and OS X, and don’t know about Flick­r­Ex­port, then shame on you. It’s a nice lit­tle plu­g­in that will let you eas­i­ly export pho­tos from iPho­to to Flickr. It con­verts your assigned iPho­to key­words to Flickr tags, enables you to add titles and descrip­tions, and choose to either add the pho­tos to a new set, an exist­ing set, or none at all – all with­in the dia­log win­dow. The one rub is that it is made by an inde­pen­dent devel­op­er, Fras­er Speirs, who has to feed his fam­i­ly – so, he charges about $25. A nom­i­nal price for some­thing that has saved me hun­dreds of hours, and enriched my Flickr expe­ri­ence. We arrived last Wednes­day, and unpack­ing is an ongo­ing project. We sold, gave away, or threw out most of our “big stuff”, so this move is not only about a new space, but also a lot of new pur­chas­es. A lot of the stuff we got rid of was from our col­lege days, and had also already made it through our fire. I’m most excit­ed about our new sofa, which Lisa bought from Room & Board in SoHo. Thanks to Jason and Liz for tip­ping us off to this place – we loved every­thing we saw there. Their fur­ni­ture man­ages to be very mod­ern with­out look­ing uncom­fort­able or annoy­ing. (Of course, we real­ized lat­er that we chose the same sofa as the Yovanoff-De Mase home… but hey, good taste is good taste, right? Since I bought my iPhone on June 30, I’ve been look­ing for an easy, high-qual­i­ty method for view­ing the MTA Sub­way map. The phone’s built-in Pho­to appli­ca­tion “opti­mizes” all pho­tos and images down to a dimen­sion and res­o­lu­tion that doesn’t work well for images with lots of small text and details. In search of the optimal iPhone MTA map. What I want­ed, was the abil­i­ty to view a PDF, or large PNG of the sys­tem map – and to be able to zoom in and drag it around eas­i­ly. Bill at iSubwayMaps.com out­lined one such solu­tion, which involved set­ting up a Yahoo! mail account, since IMAP mail accounts seemed to cache attach­ments local­ly on the iPhone. This did work for me, but I found the MTA’s PDF map slug­gish when zoom­ing or drag­ging around. And, I had to drill back through the Mail menus to get to my Yahoo mail account, (as I’m pri­mar­i­ly a Gmail user). File­marks let you store high res images, text files, and PDFs on an iPhone! File­marks let you store much high­er qual­i­ty images than the built in pho­to appli­ca­tion. File­mark Mak­er gets around the lim­i­ta­tions out­lined above, by writ­ing files to a temp loca­tion on the device’s HD, by using Safari book­marklets. Then, the files are acces­si­ble in Mobile­Sa­fari. And, because the files are writ­ten to iPhone’s HD, the book­marklets work whether you’re online or not – or whether you’re above ground or not. Presley’s new tat­too, done by Cus­tom Claire, of Fat Ram’s Pump­kin Tat­too, Jamaica Plain, Mass­a­chu­setts. In the end, I decid­ed to go with The Lit­tle App Factory’s M-Beat, which sat­is­fies all of these require­ments, and includes sup­port for skin­ning themes. I neglect­ed to men­tion in my post about installing the Air­port Express with a 3rd-Par­ty router, (a Net­gear WGR614, in my case), that I still couldn’t print wire­less­ly with the device. My HP PSC-750 All-in-One isn’t sup­port­ed… it makes sense that you wouldn’t be able to scan wire­less­ly, but why couldn’t I print? UPDATE… I neglect­ed to men­tion that I am not using the bloat­ed and shod­dy dri­vers pro­vid­ed by HP. I would instead rec­om­mend the HPIJS Open-source dri­vers. These dri­vers allows print­ing “over any avail­able con­nec­tion such as USB, AppleTalk, TCP/IP (via LPD and IPP), HP Jet­Di­rect, and shared win­dows print­ers via SAMBA”. And, you don’t have to install the use­less extra HP appli­ca­tions, which are includ­ed with the dri­ver pack­age. After read­ing Dunstan’s humor­ous post on British rail, and the sil­ly respons­es he received from Amer­i­cans and Ger­mans, I was remind­ed of an excel­lent arti­cle by William Finnegan in the New York­er last week, Under­ground Man: Can the for­mer C.I.A. agent who saved New York’s sub­way get the Tube back on track? After scour­ing the New York­er web site and Google with­out luck, I decid­ed it was worth scan­ning and post­ing the arti­cle. Sor­ry they’re jpgs… I prob­a­bly won’t leave it up very long (file size/bandwidth), unless some­one can sug­gest a way to extract the text of the arti­cle. I enjoyed going through my pho­tos of our Mia­mi and the Flori­da Keys trip in ear­ly Jan­u­ary. After break­fast as Magrove Mike’s in Islam­ora­da, we start­ed head­ing west. We stopped briefly at the Bahia Hon­da State Park Beach for some sun and splash. I read, while Pres­ley napped. Arriv­ing in Key West, we missed the Sun­set cel­e­bra­tion because I need­ed to find an Inter­net Cafe—my boss called me and told me that I had for­got­ten to sub­mit my timesheet, and if I would like to get paid, I had bet­ter do so. So, after the busi­ness was tak­en care of at the Sip­pin’ Cafe, we checked in the La Pen­sione Inn on Tru­man Ave. near Duvall Street. Appar­ent­ly Har­ry S spent some time here. Head­ing out onto Duvall Street should be an adven­ture, but we found most of the restu­ar­ants and bars to be lack­ing in patrons—maybe it’s the time of the year. After walk­ing around for what seemed like hours, we set­tled on Caroline’s Cafe for din­ner, because you could sit out­side and drink Mar­gar­i­tas and Coro­nas while watch­ing rev­el­ers on the street. God, there are so many old peo­ple here! After down­ing a few drinks with din­ner, (I had the Mahi-Mahi cooked cajun style, Pres­ley had a whole cooked chick­en, I kid you not), we decid­ed to hit a few bars. There was the Irish bar, with the vil­lage drunks (and no females), and then there was the Karaoke bar next to Crab­by Dicks, with Marie behind the bar, and Karaoke’ers belt­ing our Coun­try songs in the back. At least there were some women at this place… Pres­ley did a rous­ing ren­di­tion of Cheap Trick’s I Want You to Want Me, though I think this crowd didn’t appre­ci­ate it as much as I did. What a busy day! We got up this morn­ing, deter­mined to go snor­kel­ing. We’ve learned one thing about Key Largo—there is utter­ly noth­ing worth doing in Key Largo besides snor­kel­ing, div­ing and out­door activ­i­ties. We rent­ed a dual kayak, and pad­dled around the man­groves in the Pen­nekamp State Park . And, at 1:30, we took a 38’ Cata­ma­ran sail­ing out to the coral reef, strapped on some fins and masks, and plunged into the 72-degree water to look at fish. Even though 72-degrees sounds like warm water, it’s bet­ter to wear a wet-suit, though it will make you look ridicu­lous. We saw these blue and yel­low zebra fish, a foot-long rain­bow look­ing fish, and some gray bar­racu­d­as who looked una­mused. Note for future ref­er­ence: bring clothes for the sail back to shore, no mat­ter what the cabana boys say in the gray shed. Fol­low­ing the advice of our Cap­tain (what was his name? ), an old for­mer hip­pie who had been sail­ing for 22 years, Pres­ley and I head­ed for Bentley’s, south to MM 83, for din­ner. As we arrived, we noticed a man and his daugh­ter that sailed with us ear­li­er in the day—apparently they took the same advice from the Cap­tain. We chat­ted at the bar with Danielle and Mr. Bern­stein from North Car­oli­na. She is a fresh­man at Vir­ginia Tech, study­ing chem­istry, which was my first major, after­all. When we were final­ly seat­ed, we went a lit­tle over­board (pun? ), and went with 1 dozen steamed clams. Pres­ley ordered a glass of Ries­ling, and the Grassy Key Lime Yel­low­tail, and I asked for a glass of Fume Blanc from Sono­ma, and the Yel­low­tail stuffed with crab meat. mmmm… This was def­i­nite­ly the place to eat, though I think Ballyhoo’s has bet­ter food, (though, in a much more casu­al atmos­phere). It’s freez­ing! tem­per­a­ture is in the teens, and we’re late out the door to Logan. Since we live clos­est to the Green line , we decide to walk over the Charles to the B-line. But, tem­per­a­ture is in the teens! I’m wear­ing a light jean jack­et with a thick wool turtle­neck sweater, a knit hat, but no gloves! Pulling my suit­case around the rotary, and onto the bridge—it’s sooo cold. And it’s almost 7am. Our flight leaves at 8:05! Des­per­ate mea­sures! We call Boston Cab, and have them meet us on the Boston side of the Charles. 5 min­utes lat­er, a cab pulls up, and our dri­ver throws our suit­cas­es in the trunk. I’m glad to be out of the cold. 15 min­utes later—7:15—we’re pulling up to Ter­mi­nal C, hav­ing trav­elled south­bound in the new big dig tun­nel for the first time. The fare is $22.15, thought the dri­ver says he hit the wrong but­ton and over­charges… I give him $30—far too much, but he got us there quick, and that kind of solace is worth a 50% tip. Just made it through secu­ri­ty to board our Song Air­lines flight to Ft. Laud­erdale. As cheery and styl­ish the new Song brand­ing is, the brand doesn’t extend well into the cab­in. Sure, the seats are leather, but they’re this odd light blue col­or, and each seat has a bright accent leather—pink, green, orange. I think that it’s sup­posed to be styl­ish, but it comes off look­ing like an air­line for the Romper Room set… very Micky Mouse. Per­haps Kate Spade hasn’t put her final touch­es on yet. A while back, Jason Kot­tke began tweak­ing his site lay­out, merg­ing his “remain­der” links into the dai­ly thread of his weblog, and cre­at­ing a dif­fer­ent look for “Fea­tured” posts such as movie and book reviews. When I last redesigned (now more than a year ago), I thought a lot about how to use MT cat­e­gories, and the impor­tance of draw­ing a visu­al dis­tinc­tion between fea­tured posts, and short­er dai­ly posts. It was nec­es­sary to weigh cer­tain types of posts as more rel­e­vant than oth­ers. This not-so-cre­ative solu­tion was to use a styled post title & a unique icon—for music, movies, books, pho­tos, & spe­cial posts—and leave non-fea­tured posts unstyled (albeit bold­ed). Also, I try to use a small pho­to for each fea­tured post. By using PHP and some MT tem­plate code, I was able to hack some­thing togeth­er. Jason’s method of using 5 weblogs for 5 dif­fer­ent kinds of posts seems over­ly com­pli­cat­ed and unwieldy for me, because I have oth­er blogs on our domain. But, there is a point where PHP hacks can defeat the pur­pose of using “push-but­ton pub­lish­ing”. I very much like his idea of embed­ding these remain­dered links in the chrono­log­i­cal thread of the weblog—Because these are time­ly links ref­er­enc­ing cur­rent events or memes, why not? Since we’re in the process of mov­ing, I’ve spent a lot of time switch­ing util­i­ties to the new apart­ment. When you log in, the account sum­ma­ry dis­plays the amount you owe, list­ed under “Pay­ment due” (see screen-shot at left). So, I would peri­od­i­cal­ly log in, note the dol­lar amount, and after a few clicks, a cred­it-card pay­ment was sub­mit­ted. There is a prob­lem with this sys­tem however—the bill sum­ma­ry info is tak­en direct­ly from your last print­ed bill, and is in no way reflec­tive of any pay­ments made since the billing date. This result­ed in us over­pay­ing month after month. Gen­er­al­ly, it seems to me that a brief account sum­ma­ry should show your up-to-the-minute bal­ance, and click­ing “View Bill” should show your last print­ed bill (which may not show recent pay­ments). This log­ic, how­ev­er, seems to have escaped Verizon’s web team. Instead of the cur­rent bal­ance greet­ing you after log­ging in, you’re forced to click on “View Bill”, and scroll down the page to a curi­ous­ly phrased line that reads: Total Cur­rent Live Bal­ance as of 9/11/2003 is : $0 (see screen-shot at left). Total Cur­rent Live Bal­ance. Does that sound like an after­thought, or what? Why on earth would this bit of infor­ma­tion be found in the mid­dle of a past bill, and not on the billing sum­ma­ry? I can only sur­mise that a lot of users like me start­ed com­plain­ing about the con­fu­sion, so they had one of their back-end devel­op­ers insert a bit of code, with­out both­er­ing to hire a UI per­son and ask them if what they were doing was intu­itive. Though it may seem like a small issue, I think it is embar­rass­ing­ly bad—because it could cre­ate a neg­a­tive per­cep­tion that online Ver­i­zon pay­ments are a has­sle. And, it’s not going to con­vince users to switch to “Paper-Free Billing”. Attn: Ver­i­zon, I am avail­able for UI con­sult­ing. A while back, I post­ed about a piece of archi­tec­tur­al won­der­ment lying van­dal­ized and dor­mant in Buffalo—the old Cen­tral Ter­mi­nal. It’s a beau­ti­ful Deco train sta­tion from the 1920s, plopped into an oth­er­wise unex­cep­tion­al sub­ur­ban neigh­bor­hood. At the time the sta­tion was built, Buf­fa­lo was still an indus­tri­al and cul­tur­al cen­ter, with a pop­u­la­tion over one-half mil­lion. It was sec­ond only to Chica­go for its tan­gling rail net­work. How­ev­er, by the late 1970s, both the city and the sta­tion had seen bet­ter days. The sta­tion was board­ed up, and the trains instead stopped at a new, strip-mall like park­ing-lot sta­tion not far away. Well, there is some good news… it seems that some peo­ple do care about pre­serv­ing the city’s her­itage. Despite its van­dal­ized and trashed inte­ri­or, the build­ing is draw­ing crowds—including some Cana­di­an urban explor­ers. What I love about struc­tures like the Cen­tral Ter­mi­nal is that they were built for the pub­lic to use. It’s absolute­ly unthink­able to imag­ine pri­vate cor­po­ra­tions build­ing such pub­lic spaces today—I think those years have passed, (as have the years of ridicu­lous­ly cheap immi­grant labor). Here’s hop­ing there is a devel­op­er out there with deep pock­ets and a cre­ative will. Ken­more Square, Boston, has always had a rep­u­ta­tion for being a lit­tle bit seedy—much the way Times Square used to be. It boasts a major Sub­way inter­change, the best Ball­park in the Amer­i­can League, if not all of base­ball, and it used to be home to a diverse group of small busi­ness­es and restau­rants. When I first moved to Ken­more Square, in 1996, there was a Methadone clin­ic, a punk-rock venue called the Rathskeller, a late-night restau­rant called Deli-haus, a grit­ty cof­fee house called Fuel, and a bunch of oth­er busi­ness­es housed in the clus­ter of Brow­stones on the oppo­site side of the Square. In 2003, chalk these land­marks into a new chap­ter of Lost Boston. When Boston Uni­ver­si­ty pro­posed bull­doz­ing much of the south side of the square, and replac­ing the cen­tu­ry-old brown­stones with a “Euro­pean-style” hotel, city and com­mu­ni­ty lead­ers large­ly sup­port­ed the idea… large­ly, I sus­pect, because BU was will­ing to pay gen­er­ous­ly to relo­cate affect­ed busi­ness­es with neigh­bor­hood asso­ci­a­tion ties, such as Cornwall’s Pub. Also, the uni­ver­si­ty is giv­ing mil­lions to upgrade the Sub­way sta­tion and traf­fic con­fig­u­ra­tion in the Square. Whether or not you iden­ti­fy with my bemoan­ing the loss of a funky piece of an oth­er­wise bor­ing city, what is not in ques­tion is the pub­lic reac­tion when the work­ers final­ly unveiled the facade. For a hotel look­ing to project Con­ti­nen­tal lux­u­ry and flair, it looks like a repro­duc­tion on the back lot at Uni­ver­sal Stu­dios, or, per­haps, Main Street USA, Dis­ney­land. Tacky, cheap, and an insult to a city with tru­ly excep­tion­al archi­tec­ture. I am not, I think, an elit­ist when it comes to archi­tec­ture… I think clas­si­cist ideals of style and mate­ri­als are prefer­able to 90% of all avant-garde rub­bish of the past 50 years. But, BU and the devel­op­ers cheat­ed by try­ing to copy the style of the French Sec­ond Empire, while using mate­ri­als com­mon on a Wal-Mart job site. Instead of lime­stone, let’s use fiber­glass. Brick too expen­sive? Sub­sti­tute fiber­glass for the real thing. And, the dorm­ers can just be cut-outs—I mean, who looks that close­ly, right? The fact is, this hotel would look pret­ty good from your car on the Inter­state at 75 MPH, if it were locat­ed out in the sprawl belt of I-495 and 128. It’s car­toon col­or and fea­tures would blur from the high­way strip. But, this hotel is in the heart of the city, with thou­sands of pedes­tri­ans walk­ing by each day. And it looks Mick­ey Mouse, com­pared with the sur­round­ing build­ings. The pho­tos I took, unfor­tu­nate­ly, fail to show how bad the facade real­ly is. Trust me, it looks as if they were try­ing to save a few bucks… which is pre­cise­ly not the image you’re going for in a 4-star hotel that wants to charge hun­dreds of dol­lars a night. Appar­ent­ly, BU and the devel­op­ers are going to spend $2 mil­lion to “fix” the facade. Good luck. Public = Avant Garde ?? I read a lit­tle piece in the Times today con­cern­ing the two final­ists cho­sen by the LMDC for the World Trade Cen­ter, and I have a few reac­tions. “[Daniel Libeskind’s design] is an emo­tion­al­ly manip­u­la­tive exer­cise in visu­al codes. Alright. Does any ordi­nary user of the World Trade Cen­ter — work­er, tourist, sub­way rid­er, etc. — have any idea just what Mr. Muschamp is talk­ing about? Why has archi­tec­ture become this jar­gony realm of intel­lec­tu­al non­sense? I don’t know. The death and destruc­tion of WWI caused a huge shift in West­ern val­ues, specif­i­cal­ly because sci­ence and tech­nol­o­gy was employed so suc­cess­ful­ly in the killing of a gen­er­a­tion of men. In the decades after the war, the long-held ide­al­ized notion that tech­nol­o­gy would ush­er in peace and pros­per­i­ty was dashed, and many of the pre­vail­ing assump­tions in the arts were also vacat­ed. It was in this void that the Mod­ernists arrived– along with their avant garde aes­thet­ics and their intent to social engi­neer. So what has Mod­ernism accom­plished? Well, not much good. We’ve still got the rich and poor, yet we have ugly civic space. For instance, the orig­i­nal WTC was a wind-swept, anar­chis­tic struc­ture, cut off, and hor­ri­bly out of scale from the sur­round­ing streets and neigh­bor­hood. When you stood in the Plaza look­ing up at the struc­tures, it was dif­fi­cult to feel any­thing but dread. In fact, that seems to be a pre­vail­ing require­ment of the Mod­ernists– your build­ing must impart DREAD. Unless, of course, you are one of the ini­ti­at­ed. You have to be edu­cat­ed for sev­en years at MIT to under­stand the beau­ty of the Bru­tal­ist form. And… the longer I study Mr. Libeskind’s design, the more it comes to resem­ble the bland­est of all the projects unveiled in the recent design study: the retro vision put forth by the New Urban­ist design­ers Peter­son Lit­ten­berg. Both projects trade on sen­ti­men­tal appeal at the expense of his­tor­i­cal aware­ness. Both offer visions of inno­cence ? nos­tal­gia, actu­al­ly. Peter­son Lit­ten­berg is nos­tal­gic for Art Deco Man­hat­tan cir­ca 1928, before the stock mar­ket crash caused the Unit­ed States to aban­don the pre­vail­ing ide­ol­o­gy of social Dar­win­ism. Mr. Libeskind’s plan is nos­tal­gic for the world of pre-Enlight­en­ment Europe, before reli­gion was exiled from the pub­lic realm. This is always the argu­ment of these elite intel­lec­tu­als against clas­si­cism — that some­how, orna­ment, scale, pro­por­tion­al­i­ty and human­i­ty are to be despised as Impe­r­i­al. Now, obvi­ous­ly both plans are far from Clas­si­cism, but, in the inter­est of democ­ra­cy, why cry his­tori­cism when the alter­na­tive is intel­lec­tu­al­ized ugli­ness? The gen­er­al pub­lic, I believe, longs for dig­ni­ty in pub­lic archi­tec­ture. I pre­fer the Think project, but the lat­tice work looks like Tin­ker­toy, and I find it tacky that they have pods with­in the lat­tice­work. How intim­i­dat­ing would it be to get in an ele­va­tor, and shoot up 100 floors to a “cul­tur­al space”, know­ing full well that there is noth­ing but air and Tin­ker­toy beneath you? Fright­en­ing. The Eif­fel Tow­er it is not. No doubt what­ev­er gets built at the WTC site will be very mod­ern, and cut­ting-edge. It is my hope that it exem­pli­fies the dig­ni­ty and pur­pose human beings deserve and crave. Let the peo­ple choose, not the intel­lec­tu­als. I was futz­ing around in Pho­to­shop the oth­er day, in-between work­ing on some free­lance gigs… (it’s com­ing matt! )… and I cre­at­ed this lit­tle vec­tor­ized ver­sion of the new Charles riv­er bridge in Boston. I think it’s fab­u­lous that the city named it for Lenny Zakim, a civ­il rights activist and com­mu­ni­ty leader—especially giv­en that he passed-away in 1999. I cer­tain­ly under­stand why gov­ern­ment build­ings and oth­er projects are named for WWII heroes and long-dead (some cor­rupt) politi­cians, but I’m encour­aged by this choice… It’s a mod­ern, per­son­al and mean­ing­ful choice. Per­son­al­ly, I’m kind of ambiva­lent about all of this Big Dig stuff. Ele­vat­ed high­ways are evil, so I will be glad to see the Green Mon­ster come down. Still, what will be put in it’s place? And at what cost? The cur­rent plans call for most­ly green “open” space, sur­round­ed by sur­face roads that might have as many as 4 lanes. Whoa. Wait up. You’re replac­ing 8 lanes of ele­vat­ed high­way, with 8 lanes of mod­ern, wide-lane sur­face streets. Not to men­tion the 10 lanes under­ground. It would be a mis­take to try and cor­rect the trans­porta­tion and urban renew­al mis­takes of the 1950s, by drop­ping a nar­row park in the mid­dle of all that asphalt. This city needs to knit back togeth­er the fab­ric of a neigh­bor­hood that was sheared in two. That means mod­er­ate­ly-scaled build­ings, shops, caf?s, side­walks and, in the mid­dle of all this: a park. Maybe with a foun­tain. And, you’ve got to min­i­mize traf­fic. Make it dif­fi­cult for cars to move through there. Down­town Boston burned in 1872, so rein­vent­ing down­town is noth­ing new. I’d hate to think that this sce­nario would unfold: Devel­op­ers get to build tall, pri­vate sky­scrap­ers cut off from the street; the fire depart­ment gets wide traf­fic lanes; the tree-hug­gers get the rest as dead “open” space. That’s a recipe for a non-place. This should be the place… the des­ti­na­tion.